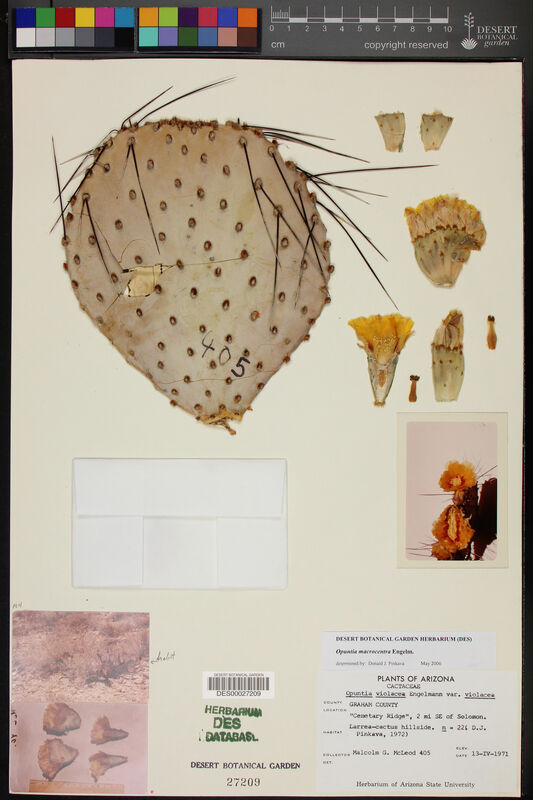 Opuntia macrocentra is a much-grown and much-enjoyed prickly pear cactus found in western gardens. It is related to O. azurea. O. macrocentra plants are spreading to upright plants, 30-60 cm tall or taller. Cladodes are obovate to orbicular, 10-20×10-20 cm, or the pads are slightly wider than long. Spines may be produced on the upper one-fourth of the pad or only in the upper edge areoles. Occasionally, plants may be essentially spineless. The largest spines are often directed upwards. Spines are black to reddish-brown and 5-10 cm long. Flowers have sharply defined, bright red centers that may be star shaped. They are 6-8 cm long and 5.5-8 cm wide. The filaments are about 1.5 cm, pale green proximally and cream-colored distally. Anthers are yellow. The style is cream-colored and 1.7-2 cm long. The stigma lobes are cream-colored or pale green. The reddish fruit is oboviod, ovoid, or ellipsoid, 3-4.3 cm long, 1.5-3 cm in diameter, and deeply concave. The rind is purple and the juice and pulp are pale-purple to clear. Seeds are flattened, tan, 3.4-4.5 mm in diameter, 1.5-1.9 mm thick with a broad notch on one side and a prominent raphae. O. macrocentra has been confused with O. chlorotica santa-rita and O. azurea, but the three cacti are distinct. It is unfortunate that O. macrocentra was sometimes mislabeled as a prickly pear variety of O. violaceae because O. violaceae is a nonexistent species. 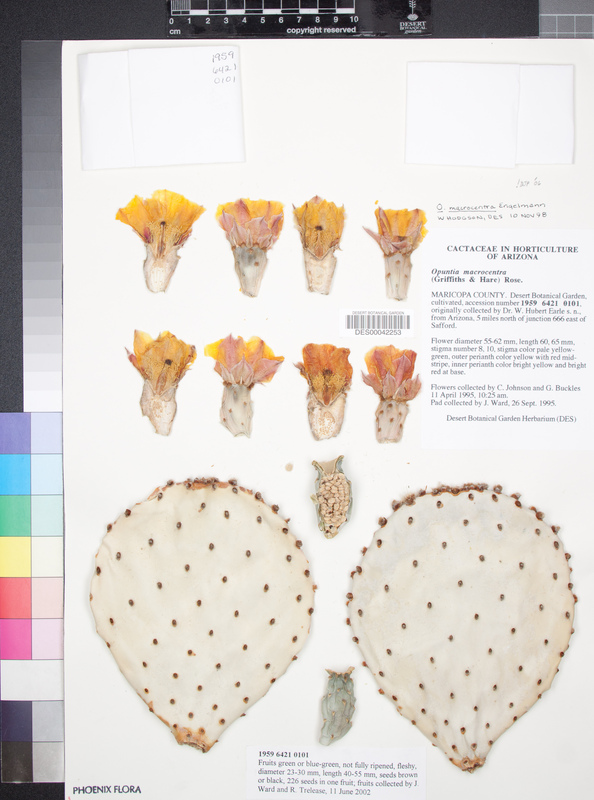 Britton and Rose reported that specimens with bluish pads can be especially showy. See the original description. O. macrocentra may be tetraploid or diploid. O. macrocentra minor has been described, and it is diploid (see Powell and Weedin). O. macrocentra is an excellent garden plant in many climates. Its striking color and beautiful flowers are impressive. It is easy to grow in USDA climate zone and warmer if the climate is not to wet. Thanks for visiting the Website. O. macrocentra is surprisingly hardy in desert or semi-desert areas. One survives at 7,000 ft in Santa Fe, New Mexico. That one has taken -10F. It grows partially under a tree and so may have gotten some protection. Normally the plant comes from the southern part of New Mexico and Texas. Generally, desert Opuntias are not as hardy in humid/wet climates as they are in dry climates. It helps to plant them against a wall the reflects winter heat/sun. It helps them to be next to a structure that might give off some warmth. It helps them to have very good soil drainage.